Stacks Collections help you to manage all your internal content repositories. 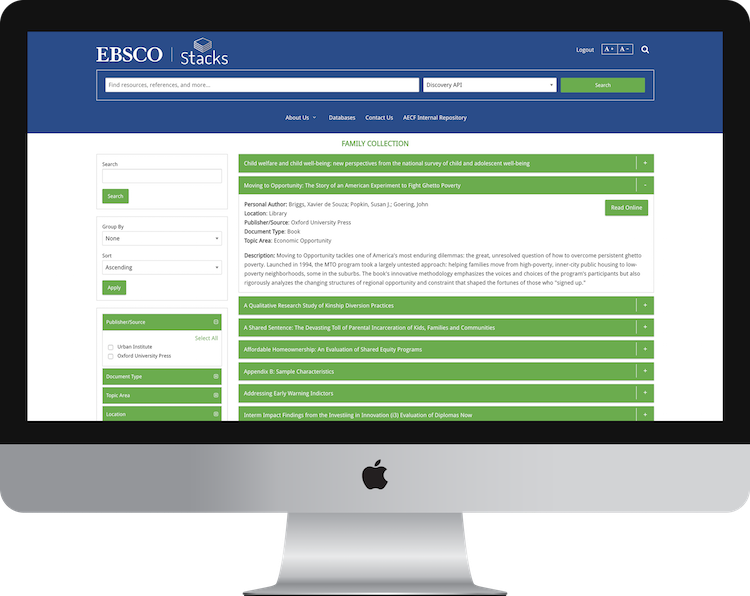 From documents to media, Stacks collections empower you to upload comma-delimited lists of resources. Custom map and label any metadata into a faceted search experience embedded right within your Stacks website. Collection items can link to documents or be made available for download. 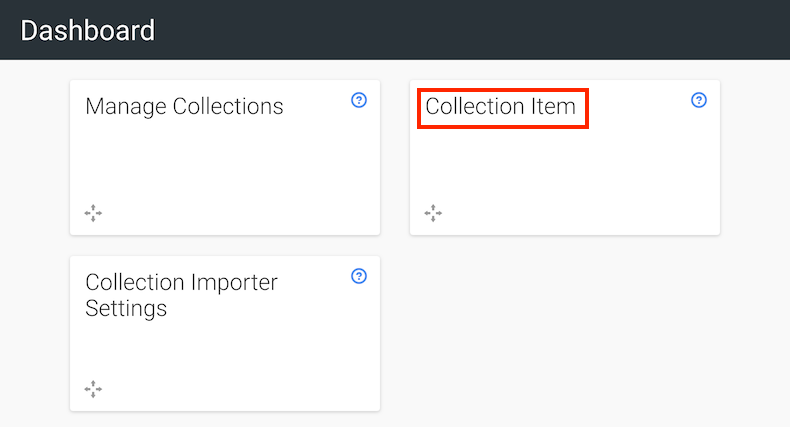 Create and manage pages of unique Collections. Each Collection you create can have its own customizable filter and facets. Collection items can link to documents or can be made available to download. 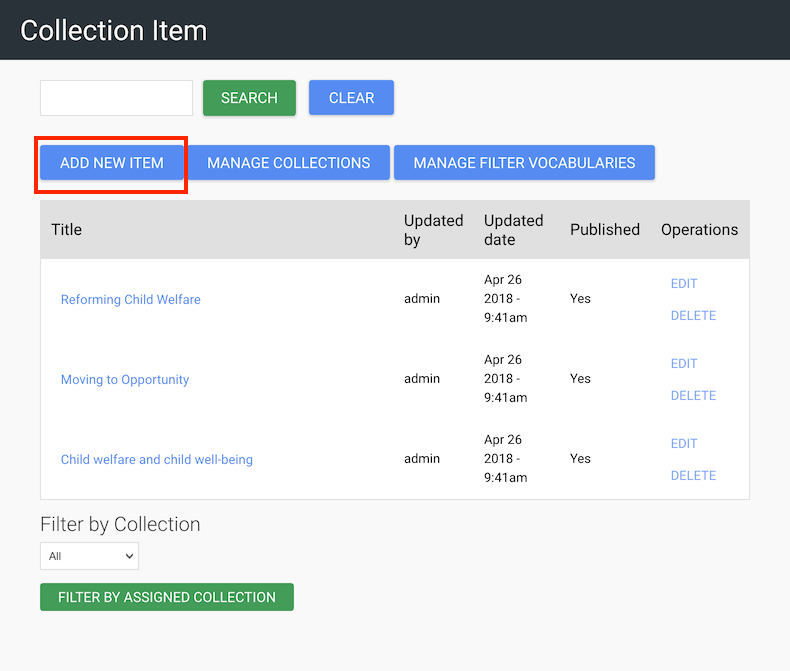 The first step toward managing Collections in Stacks is to add a new Collection. 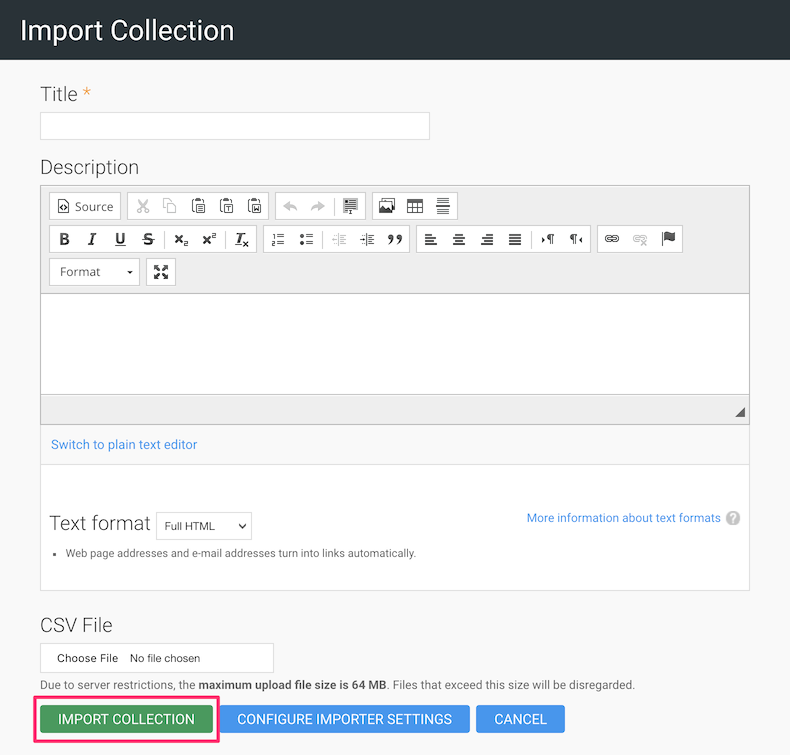 Note: Before you can import items into your Collection you need to configure your Collection Importer Settings. Attach your files. Keep in mind that Public files can be accessed externally to your site with the correct URL. Private files can only be viewed by users who are authenticated (logged into) your site. Before mapping the columns in your spreadsheet to regular fields or filter vocabulary fields in importer settings you may want to adjust the labels for all of these fields. This can be done from the Site Labels area in Stacks. For information about adjusting these labels see Site Labels. Regular Fields are intended to be used for values that describe the item itself. Some of these fields are also unique. For example, each item should have a unique title. Filter Vocabulary fields are intended to be used for values that describe a group of items. These fields are often repeatable. 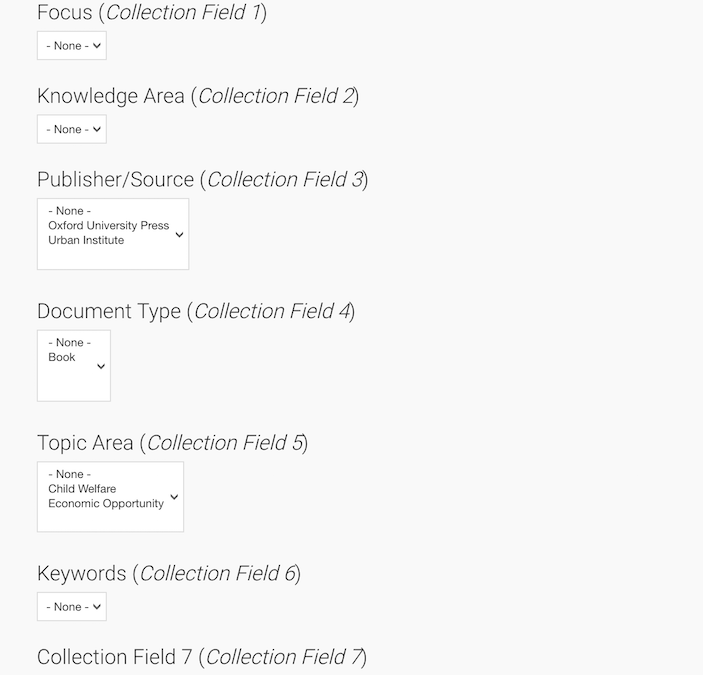 For example, a column that contains material types could be mapped as a Filter Vocabulary and many items could be included such as a value like 'White Paper'. 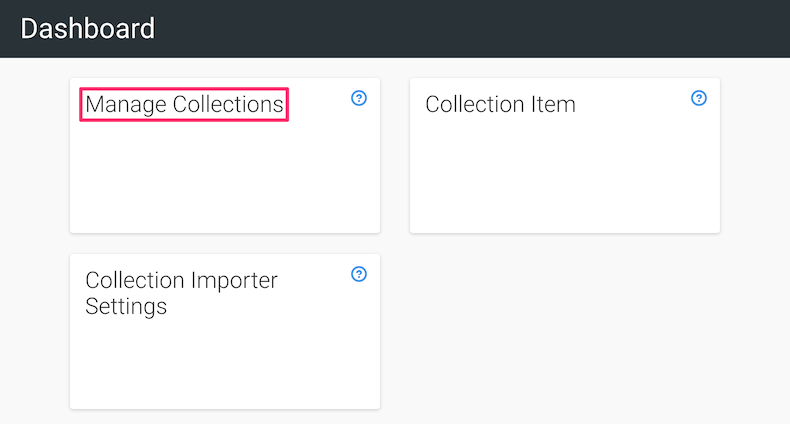 You are able to associate files with the collection items that you are importing. Keep in mind that you must have first uploaded those files to Stacks. Files can be uploaded into Stacks as public or private files. You must indicate the type of file directory that the associated files have been uploaded to in Stacks. Keep in mind that Public files can be accessed externally to your site with the correct URL. Private files can only be viewed by users who are authenticated (logged into) your site. Extra settings allow you to specify how cells with multiple values should be identified and imported. 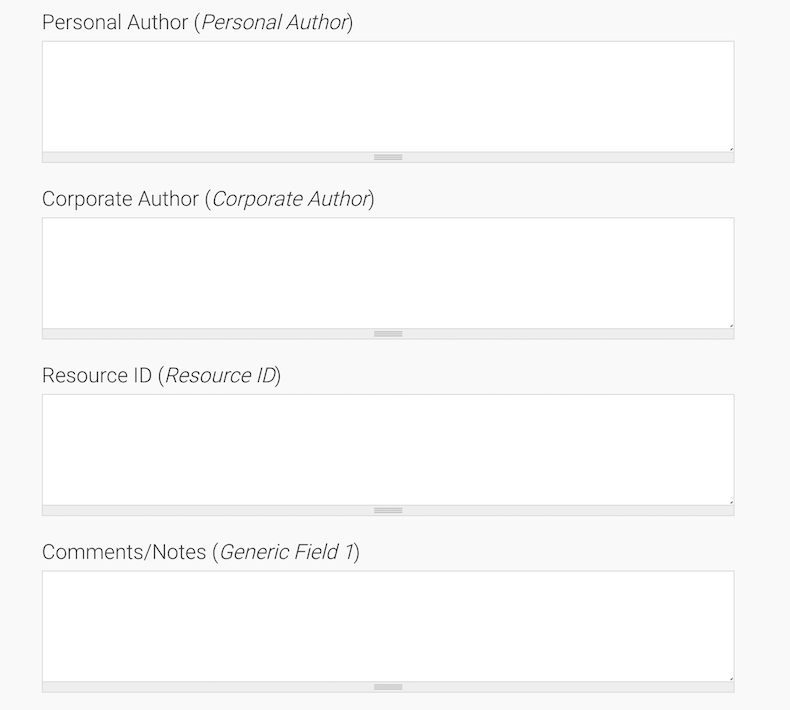 For example, if you have a column for an author and some of your items have more than one author. You can tell Stacks that author names are separated by a # sign. (Eg. Author1#Author2) Stacks is then able to create these two terms and assign them to the item. 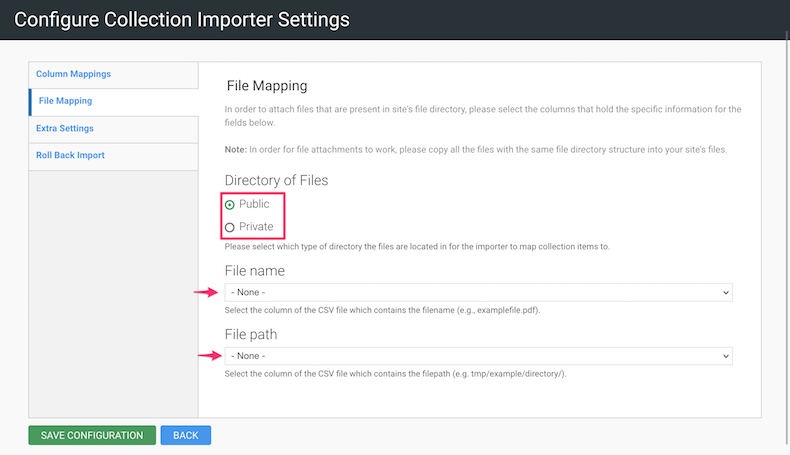 You have the ability to undo an import if for some reason you have used the wrong field mappings etc. This allows you to remove all the content that was created without having to delete all of the items and associated vocabularies manually.